Online TEFL courses are very practical for individuals who aspire to get certified for teaching English abroad but cannot study in an onsite program due to time or work restrictions. High-quality online courses are operated in high-performance learning systems such as Moodle, where students are able to access anytime, carry out their coursework and track their progress at the same time. To see just how beneficial an online TEFL course on Moodle is, it helps to look at the features and what this means for those who want to enroll on such type of TEFL course. 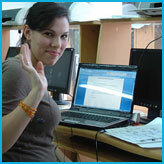 These are just a few of the features that an online TEFL course on Moodle has to offer. Thanks to customizable options, every teacher training course may have a different look, but it is all simple to use and understand. Interactive learning often creates a comfortable environment for the students. When you enroll in an online TEFL course on Moodle, you have the ability to communicate with instructors and classmates almost as easily as if you were sitting in the same classroom. All of your files and assignments are in one convenient location. You should even be able to track your progress with your assignment and possibly your current standing or grade in the course. Since the course and all of its documents are online, you should be able to access them from anywhere if having internet connection; are actually assigned your own username and password to enter your own account. Most features should soon be available as an application on a mobile device, such as your smart phone. Depending on how the course is set up on Moodle, you should be able to access all of your reading material, assignment instructions with just one click. The best benefit to Moodle is simply how overall convenient it is. If you find an online TEFL course on Moodle, you will probably be impressed at how easy to access and efficient the course is. As far as completing your assignments at home on your own time, Moodle helps you keep track by adding a checkmark to the assignments you have completed. For an online course that is interactive, easy to use, and well-structured, look for a TEFL course that utilizes up to date teaching and learning systems such as Moodle.